Limelight No. 1 in 20cl. This is the standard clear glass tumbler with a burn time of up to 40 hours. 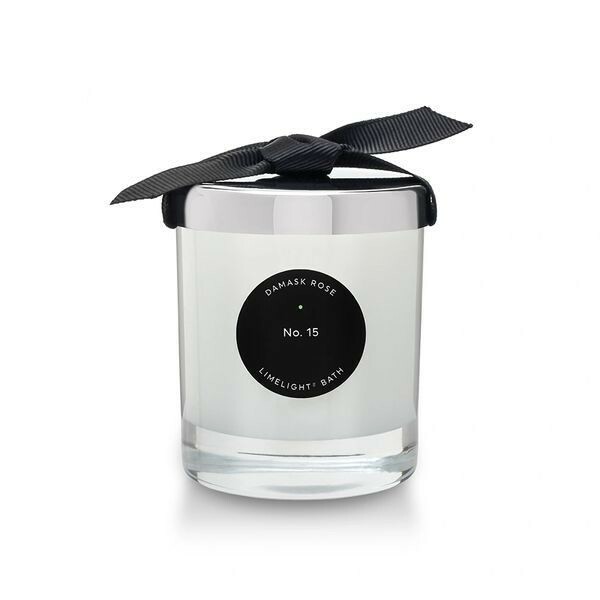 In a beautiful straight sided heavy glass whisky tumbler, this candle is wrapped in black tissue paper and comes in a lovely heavy black box with black grosgrain ribbon, ready to give away, although that might be hard! It weighs 400g (dimensions are 8cm x 7.6cm). Roses are gorgeous to look at but most commercially available roses do not have any scent. This is the finest damask rose scent and smells just roses just cut from an English rose garden, with the finest hint of green stems- not sweet or cloying, just lovely. It takes me back instantly to my Granny Violet, as she always had a bunch from her lovely garden in a silver basket bowl in her hall in the summer months. Just beautiful.